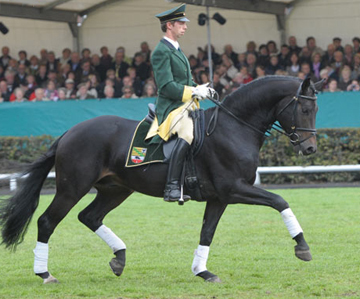 The first outcome of the Central German Cooperation of the Landgestüte Sachsen-Anhalt and Moritzburg was the purchase of Fürst Wettin at the 2008 Hanoverian Licensing Auction in Verden for sport horse breeding in central Germany. Since then, he has ranked among the winning types of his profession: Victory in the 30 Day and 70 Day performance tests and victory in the young horse classes! His elegant stature, lifting ability, and active, ground covering movement create an incomparable presence. His sire, Fürst Heinrich, developed quickly as a sire with beautiful and strong moving offspring who have been licensing champions, show champions, top priced auction horses, and Bundeschampions. After his early exit from the breeding stage, his approved sons are advancing even further as promising sires for dressage horse breeding. With Friedensfürst as damsire, the willingness to perform of Fürst Wettin’s athletic mare line is reinforced. 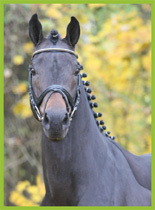 The metered insertion of jumper traits in this modern dressage breeding comes from the grand sire Calypso II. It is through him that the double nature of Fürst Wettin was founded. The heredity of type is especially confirmed by Gelria who is in the 4th generation, as well as appearing directly in the pedigree as the damsire of Friedensfürst. In 2010, the first foal year of Fürst Wettin was also watched closely over the breeding regions. Next to super Premium Foals at the local foal shows, two movement artists were sold at the South German Foal Auction in Nördlingen.